Super Hero Boy: A fuzzy friend sure to please! A fuzzy friend sure to please! Wowwee has been enchanting us with their amazing robotic plush and toys since the moment we laid eyes on Robosapian what seems like a lifetime ago. Our newest friend thanks to the good people at Wowwee is the smallest yet but we don't consider him the least at all. Wowwee's Alive line was a hot pick from our holiday guide last year. Actually our Wowwee Alive Panda Cub has been a topic of hot discussion the last few months in the household as Connor's imagination has really exploded in the last few months and he is convinced that the Wowwee Alive Panda is not only actually live but he demands that I cradle it and comfort it when it cries as he thinks its "sad". heh. The only issue I've ever had with him is that he's a bit big for Connor's small size so he's sometimes a little bulky to carry around and I'm not keen on taking him in the car as I'm terrified we will loose him. 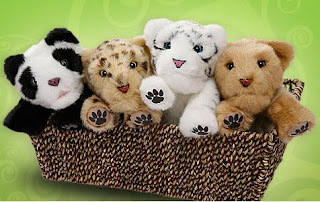 Wowwee has a new line of Alive Cubs available called Wowwee Alive Mini Cubs which offer many of the cool features of the larger sized Alive Cubs as well as the addition of a bottle where you can feed them. The big difference is they are about half the price of their larger siblings and less than half the size. They are absolutely the perfect alternative for smaller hands and much cheaper! Connor absolutely loves his Wowwee Mini Alive Cub Tiger and it's really easy for him to snuggle up with and the addition of the ability to feed him is a huge plus as I've heard over and over that our Panda is hungry. The biggest difference other than size in the Alive Cubs and the Mini Alive Cubs is the fact that the minis do not feature the same robotic facial gestures that the larger Alive Cubs do. They still sleep when you lay them down and they make the same adorable sounds that their larger counterparts do. At around $19.95 each you can afford to add several to your collection as well! Check out the entire line of Wowwee Alive toys on their website and you can pick up your own Wowwee Alive Mini Cub on Amazon!